The Daya Bay Reactor Neutrino Experiment, a multinational collaboration operating in the south of China, today reported the first results of its search for the last, most elusive piece of a long-standing puzzle: how is it that neutrinos can appear to vanish as they travel? The surprising answer opens a gateway to a new understanding of fundamental physics and may eventually solve the riddle of why there is far more ordinary matter than antimatter in the universe today. Traveling at close to the speed of light, the three basic neutrino "flavors"  electron, muon, and tau neutrinos, as well as their corresponding antineutrinos  mix together and oscillate (transform), but this activity is extremely difficult to detect. From Dec. 24, 2011, until Feb. 17, 2012, scientists in the Daya Bay collaboration observed tens of thousands of interactions of electron antineutrinos, caught by six massive detectors buried in the mountains adjacent to the powerful nuclear reactors of the China Guangdong Nuclear Power Group. These reactors, at Daya Bay and nearby Ling Ao, produce millions of quadrillions of elusive electron antineutrinos every second. Refined results will open the door to further investigations and influence the design of future neutrino experiments  including how to determine which neutrino flavors are the most massive, whether there is a difference between neutrino and antineutrino oscillations, and, eventually, why there is more matter than antimatter in the universe  because these were presumably created in equal amounts in the big bang and should have completely annihilated one another, the real question is why there is any matter in the universe at all. I wonder if the "Great Attractor" (observed only by its massive gravitational effect on galaxy clusters) is actually just (ha!) the whole mass of very old and very distant anti-matter in some stupendous black hole on or near the edge of the universe's (light) event horizon so we dont actually have an imbalance after all ! This is really significant science research and discovery and sadly, it is not taking place in the United States. While the science community tries to be as apolitical as possible, the rest of the world can't help but notice how the US is paying for the last 60 years of arrogance and missed opportunities. We could have used the greatest teaching tool ever invented, television (now, the Internet) to teach every American student 4 times more than they know now. But instead of studying 6 hours per day, Americans averaged 6 hours of watching TV per day. Which is why Americans can tell you everything about the Kardashians but have never heard of neutrino's. That is why this story is coming to us from China. Hey rah, many Chinese people don't even own television sets. It's all about managing your elites, not about educating the masses. because these were presumably created in equal amounts in the big bang and should have completely annihilated one another, the real question is why there is any matter in the universe at all. Ah yes, the conjecture without any evidence whatsoever. couldn't possibly recognize that something must be wrong with the theory, not the evidence. The more we know ... (sigh) The experimentalists (as per here) are going great guns, but the theoreticians not so much! Too many particles/waves, too much hand-waving and not enough understanding. The "standard model" thinking doesn't do much for me. I am quite aware that this view is dismissed and ignored by the "mainstream" physics community nowadays. That's ok, I'll keep my money on old Einstein! The Daya Bay collaboration's first results indicate that sin2 2 13 is equal to 0.092 plus or minus 0.017. Can we not get proper formatting of equations on this site? It can explain the superluminal neutrino results observed at MINOS and OPERA experiments (between others). The antineutrino transforms into neutrino and back again and during this brief moment it behaves like so-called sterile or Majorana particle (sometimes called the Goldstone boson, too), i.e. like the gravitational wave without charge. Gravitational waves are superluminal in water surface analogy of spacetime in dense aether model, because they do play an analogy of underwater sound waves for surface ripples - so that the sterile neutrino makes a brief jump through space in this moment. Therefore such a result would be a very good confirmation of dense aether model as well. It may be an evolutionary advantage under certain circumstances. For example, I don't own a TV set too: it just steals the time and it makes the people imbecile. I think the evidence is missing for a good reason - antimatter travelling backwards in time would be repelled by gravitational fields just like unlike charges are attractive instead of repulsive. oddly enough, what are "the kardashians?" I've never heard of that before. at first i was thinking you meant like their is a country called that but then i realized odds are americans WOULD not of heard of them. U.W. Madison did contribute to this project,america played a part. This is really significant science research and discovery and sadly, it is not taking place in the United States. Who cares where it takes place? Certainly the scientific community doesn't give a ratticus' behind where significant findings are made. Certainly the scientific community doesn't give a ratticus' behind where significant findings are made. Well, not quite: we could expect, after few such an events many physicists will move to China, because they will get a better job opportunity. In particularly today, where everything in science is about grants and money. It's not good or bad in general, but its symptomatic for the gradual shift of center of research from USA to the Eastern world. Anyway, the physics of USA has still a very good starting position, it just should become less conservative and more pragmatic. What do you learn from TV nowadays anyways? in the old days there were great documentaries on natgeo and discovery, but if you want those you have to pay extra $ nowadays. MTV used to broadcast music... same story. TV is crap and outdated. 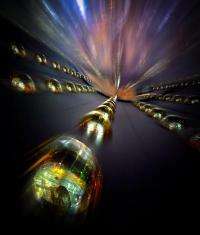 Could it simply be quantummechanical uncertainty? In the early universe, as particle-antiparticle pairs appeared, for very short periods there could a "normal" particle dominance occure, and then an antiparticle dominance. That could shift back and forth very quickly. And as the universe expanded and cooled, at one point it "froze" into a matter dominance. Simply by chance. The particles that had a antiparticle pair, annihilated each other and the univers was left with a slight matter dominance. All the matter we see today, is the remnant of a cosmic margin of error. In aether theory the antimatter didn't disappear, it was simply dispersed. I've one nice analogy for it: when you visit the Indian camp in forest, you will find only women in it. Where all their husbands are? Well, the men aren't so social, so they do prefer to hunt in diaspora. The antimatter tends to behave like tiny bubbles of space-time, so its dispersed in vacuum into finest possible particles: the positrons, neutrinos, axions and photons inside of streaks of dark matter. Note that despite men are competitive and asocial mutually, they're still attracted to women (you know, the love...) - so you can mostly find them at the proximity of camp in the same way, like we are observing the dark matter around galaxies. In the collective of pupils we can observe often, that the boys are attracted to girls, but they're bashful in their presence, so they avoid their proximity. But when boys appear together in gang, they muster their courage and they do communicate with girls a way easier. After all, the girls aren't different in this extent. So do the elementary particles: the heavier the antimatter particles are, the less bashful behaviour they do exhibit. As the result, the antigravitational behaviour of heavier antiparticles it's not so easy to distinguish from gravity of particles of normal matter. Only the most lightweight particles like the neutrinos differ sufficiently from their antimaterial counterparts.